Kale is one of those dark leafy greens that are so good for you but sound challenging to cook with. This easy and delicious recipe just might make you love this healthy vegetable! Serves 2. Put a large pot of water to boil. Add a drizzle of olive oil*, some salt, and noodles. Cook until tender (check it, may take 10 to 20 minutes). Drain and rinse in hot water to remove excess starch and set aside. While noodles are cooking, heat up 1 tablespoon of olive oil in a large skillet or wok. Add the onions and saute until soft. Add another drizzle of olive oil plus the garlic, ginger and kale. Stir together and sautee until kale is soft and fragrant. Cover with a lid and if it starts to dry out add a little water to keep it juicy. 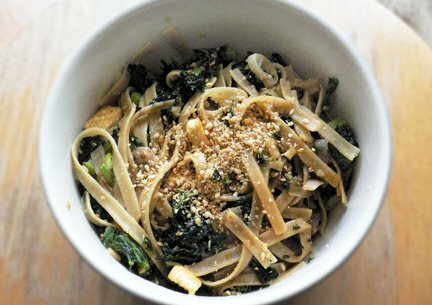 When the noodles are done, add them to the kale and toss with the sesame oil, tamari and fresh ground pepper. Serve in bowls topped with lightly toasted pine nuts and a sprinkling of sesame seeds if you like. KAPHAS use buckwheat noodles, and replace olive oil with sunflower oil and use sparingly. PITTAS go easy on the pepper and ginger, and reduce garlic to 1 clove. At the end of cooking the kale, add fresh chopped or dried herbs of your choice, like basil or cilantro. You can also add some pan-fried tofu cubes. Or for a smoky hickory flavour sprinkle 1 teaspoon smoked spanish paprika to the onions when sauteing, but then eliminate sesame oil as the flavours don't go well together.